In this Empties stash I also get rid of two products that still have a good amount of products in it but I sadly have to throw them away because I can't use them anymore. You'll see why and which products that I have to throw away once you read the more detailed information below... So let's start! Just like the Taman Sari Royal Heritage above, Sariayu is also a local Indonesian brand. I purchased this soap along with a few other products from the SariAyu Beauty Spa collection a while ago. Mangir is a traditional Javanese beauty routine, and this Mangir soap comes with a beautiful embossed carving which I love. It contains Cananga and Turmeric to make skin glows naturally. It is also made from mixed traditional herbs and flower extracts to make your skin soft and looks brighter. I really love the scent and the slightly scrubby texture of this soap which makes me feel really clean after every shower. The formula also doesn't cause any dryness on my skin. I have a few bottles of Body Splash on my vanity so I'm glad I finished another one this month to reduce the stash. Two months ago back in April I also finished another VS body splash. Victoria's Secret body splashes has always been my favorites and I've tried several scents already, and one of my favorite scent is this VS classic one which is the Pear Glace. This smells really fruity and it's very fresh and energizing. I literally been saving this one by not using it anymore after it reached near the bottom of the bottle ;p But I finally caved in and decided to finish this bottle because it's been sitting for too long on my vanity now. This is part of the L'Oreal Hair Spa series and it is one of my HG hair product, especially if my "stress-induced dandruff" decided to come back. The energizing formula of this scalp lotion is based on purified water and piroctone clamine to help fight dandruff. If you have itchy scalp like I did then you must try this one. I put this on after washing my hair when it's still damp. I put it on several parts of the scalp and then massaged it for a while to make sure it got absorbed and work it's wonders. This is by far one of the best anti-itch scalp lotion I've ever tried. This is a deep nourishing hair mask for replenished and silky hair. This 1 minute hair mask comes in a sachet so it's good for one time usage. Since I have a medium thin hair so I only need half of the amount for every usage. So I got two uses out of this one sachet. I love how my hair feels afterwards, it feels light and bouncy, and it smells great too. My strands feels really soft and it even adds a little volume too. The effect lasted for 2-3 days, but I found that I prefer the Sunsilk Salon Expert Deep Nourishing Treatment one that I tried back in April. This is not my first time finishing this product because I have a few of these hair serums on my stash and I always bought new ones every time I ran out of it because this is one of my HG hair products too, so don't be surprised if you're gonna see this product regularly on my Empties post. I finished a tube of this instant hair treatment back in March and now I have finished another tube. My hair is thin when it's wet so I only use a little amount of this serum everytime, and that's why this little tube can lasts for 3 months for me. I have oily strands so I only use a little bit to avoid my hair from being greasy. - Recommended? Yes, if you like very soft / light scrub. PS: If anyone experienced this before and knows how to bring the mixture back to it's original formula, please let me know. Or if this is the sign of a formula gone bad please also do let me know so that I can throw this away immediately. OMG this is my first ever BB Cream that I bought a few years ago (whoopss!). I think it might be already expired but since I didn't find any changes in the texture so when I found this old BB Cream again on the corner of my vanity I decided to keep using it until it's empty ;p I always like this BB Cream because it was my first love on BB Cream (since this is my 1st one ever), I like the natural finish and the medium coverage it gives. The only thing I have to pay attention when I used this is I need to double cleanse my face thoroughly after every use, otherwise it would cause me a breakout. - Repurchase? Not now, I still have a few other BB Creams in my stash. This is another product that I have to sadly throw away because I couldn't pick up the product anymore although there are still a good amount of it inside the packaging. This HD blush has a great color and it comes with a pump bottle. I think the texture has changed into a harder formula so the pump couldn't pick it up anymore. At first I have no problem in using this HD blush, but after a while of not using it I found that it changes texture, therefore it couldn't get pumped out of the bottle anymore. If you know how to fix this please do let me know so that I can still use this blush-on because I actually liked it. - Repurchase? Not sure because of the changing formula. I finished another lip balm, yay! I once stated in my February Empties post how lip balms are products that took me a long time to finish. But it turns out that I was wrong. Due to the inconsistent weather that we're having for the last few months my lips seems to be dry easily, and I found myself applying lip balms probably 6-7 times a day. My husband also experiencing severe dry lips and that causes him to use my lipbalms too. That's why my lipbalm stash are now reducing pretty quickly. In less than 6 months I surprisingly finished 4 lipbalms! That's because my lips were constantly dry because of the weather, and because I also share my lipbalms with my husband. After finishing a lipbalm last month and the month before, I now finished another one. This peppermint lipbalm is cooling on the lips and is very minty. It also has the thickest formula I've ever found in a lipbalm so it's very moisturizing especially for severe chapped dry lips. - Recommended? Yes, especially if you like natural product and very minty flavor. - Repurchase? This was sent to me for review purpose from a US company so this is not available locally. 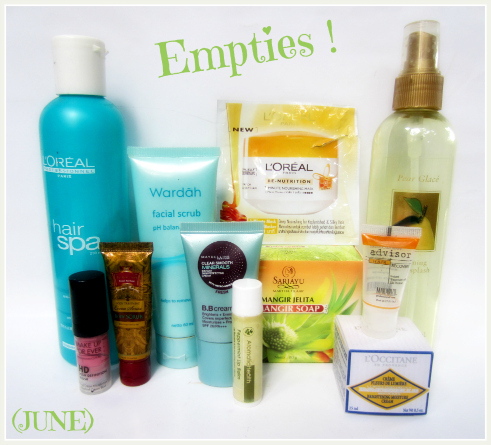 To see my MAY Empties, click here. l'oreal hair spa nya beli dimana ya? kok kayaknya ngga pernah liat. di guardian gitu ada ngga ya? Seneng dan puas rasanya kalau bisa menghabiskan produk sebelum expired..